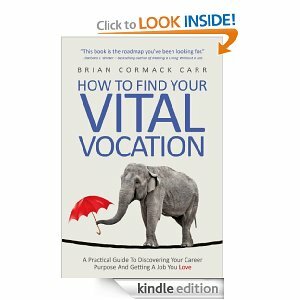 Brian, you’ve written a book entitled “How to Find Your Vital Vocation” tell my readers a bit about your book. Well, it’s a practical guide for job hunters and career changers who want something more from their working life than just a way to earn a living. It takes the reader through a process that will help them discover (or rediscover) their passion and purpose. They start by identifying their unique gifts and talents – including those they didn’t know they had – so that they can build a life and career around them. In my work as a career coach, I’ve found that this is the surest way to find real fulfillment. We have to do what we were designed to do – not what our peers or society tell us we should be doing! The title draws the reader in and I sense there is a story behind it. Please share. At the start of the book, I give a bit of my own history, and how I came to find my own Vital Vocation. I work on the principle that if I can do it, anyone can do it. After graduating from university, I trained as a personnel manager in retail, and although there were aspects of the job I really enjoyed, I just didn’t feel fulfilled in that environment. It felt like there was something missing – and that’s because there was. I needed something that was a better fit for me and so I quit my job to take some time to explore other options. It was a risky strategy, but it paid off (and I had already laid some groundwork by building up some voluntary work and eventually getting a part-time evening job in an area that really mattered to me). I moved into the charity sector and felt like I had been reborn. I was using many of the same skills and talents as I had used in retail, but this time I was working in an environment that was more aligned to my values. In fact, I discovered through this journey that a true vocation is found when all these factors – talents, values, working environment and skills – align in a way that works for us. I learned this through accident and instinct, but I’ve been able to put together a process that can be applied by anyone in order to make the same discovery. I still use it as I continue to refine my own career – I now work as a career coach and freelance writer as well as a charity CEO. I also use it to coach and train others to find their ideal work. By the way, I call it a “vital” vocation because when you find it (and “it” might be a combination of more than one income stream and interest) you’ll realize that it’s the essential piece that has been missing all along. It’s such a relief to finally find that missing piece. What was your motivation in writing this book? Really just to ensure that as many people as possible have access to a process that can help them to have happier, more productive, more rewarding lives. And also because this is my vocation – to write, and to coach others. The book is a vehicle through which I’m able to do both those things, to as wide an audience as possible. I originally offered the material as a popular online membership program, but the book really offers even more flexibility and reach. I’ve self-published it to Kindle and through Smashwords, and it’s coming out in paperback soon. It’s available all over the world thanks to today’s incredible digital publishing technology. So really, it can reach anyone who needs it. That’s an amazing thought! It’s clear that you’ve done your homework. However, based on the current recovery and recession we’ve experienced or are experiencing, how practical is it to think you can find your “Vocation”? I’m often asked that question and I must begin by saying that I never sugar-coat the situation. It is really tough out there. However, it’s important to remember that making a living and finding your Vital Vocation are really two separate things that can be brought together, but don’t have to be. Your Vital Vocation is what you must do to be happy. If you can make a living at it, great. If you can’t, then you need to find a “good-enough” job that enables you to pay the bills and that still leaves you with enough time to pursue your passions outside of the workplace. That “good enough” job has to be something that doesn’t wear you out or wear you down, so that you can put your spare energies into what matters most to you. I’ve found that, when people do that, they often discover that the two things eventually start to coincide. One client of mine – who was in a very stressful banking job – reduced his hours (and his salary) and took up gardening as a hobby. He did this to reduce his stress levels. It worked. Not only did he feel the reduction in salary was more than worth the peace of mind he gained, he was able to set up a sideline business doing landscape gardening. That business is thriving now, and he’s on the verge of leaving his banking job altogether. He still won’t be earning what he earned doing the job he never really enjoyed, but he’s happier than he’s ever been. That’s what matters to me, really. I don’t guarantee your Vital Vocation will make you rich – but nor do I guarantee that it won’t! The key message is, don’t wait around for the perfect job to appear, bemoaning the fact that you haven’t got it yet. Do what you need to do to support yourself and also find and start doing what you really love to do. Invariably, doors will open. What do you hope the reader will gain from your book? An understanding that it is possible to discover your career purpose and get a job you love. My book is full of creative tools and tips that help readers to plot their own path to their ideal work. There’s nothing more exciting than self-discovery, especially when it’s on your own terms. A number of my readers are in the media, so as we conclude this interview – what two things would you want them to know about the uniqueness of your book? Firstly, that everyone has gifts and talents – not just the famous people we see in the news. Those talents may be what society considers “modest” or even “mundane, but that doesn’t matter. If a person discovers their own talents and starts using them, whole vistas of opportunity open up. We need more, not fewer, people finding and doing their ideal work in this world. This book provides a process that enables the reader to find that work. Secondly, that because this is a self-published book, it’s available at a very reasonable price. 60,000 words of support and a whole host of resources – all for less than 5 bucks for the ebook. This is an equal opportunity career guide and I want as many people on the planet to read it so they can find their own Vital Vocation. That’s what the world needs! This entry was posted on Thursday, June 20th, 2013 at 7:45 pm and is filed under Book Reviews. You can follow any responses to this entry through the RSS 2.0 feed. You can leave a response, or trackback from your own site. Thanks for featuring me on your blog, Chuck! It was a pleasure to be interviewed by you. I’ve known Mr Cormack Carr since 2008; we met online, in a wellness forum. We live on different continents but, through the miracle of modern technology, we might as well live next door. Brian has been such a positive influence on my life with his knowledge,his words of wisdom, his generosity of spirit. If you are looking to make changes in your life, and even if your sort of not, I can guarantee that this book will have a positive impact on where you are now to help you get to where you want to be. Jamal Nayfeh - Associate Dean for U. of Central Florida Faces Fraud and Theft Charges. White Collar Crime Knows No Boundaries.